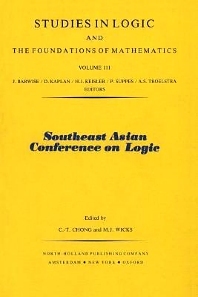 conference in Mathematical Logic. We were fortunate to receive encouragement and material support for this venture from several sources. Specific acknowledgements are made below. Sponsorship of the conference by the Association for Symbolic Logic was received and gave added inspiration. A final word in this connexion concerns the debt we owe to invited speakers who were able to provide for travel expenses from their own resources. Their presence at the conference would not have been possible otherwise. The publication of these Proceedings came about through an initiative of North Holland. The progress in producing the volume has been somewhat fitful, and we appreciate their forbearance and understanding. The items herein, with some exceptions, are written versions of invited talks given at the conference. Abstracts of contributed papers have appeared in the Journal of Symbolic Logic. The two workshops: in Recursion Theory by Mark Tamthai and Model Theory by Chris Ash, which were held in conjunction with the conference, are not recorded. We were fortunate to receive editorial assistance from John Bell during his visit to NUS. A great debt is owed to Mimi Bell and Madam Lam for producing the splendid typescript for the volume.